Small Benchtop Flow Cytometers from Stratedigm, Inc.
Purchase a Stratedigm benchtop flow cytometer and be confident that you have made the best possible flow cytometry investment. Stratedigm offers seamless integration of automation, high-throughput technology, instrumentation, and software that delivers the utmost in productivity. With more performance to meet today’s requirements, you have more compatibility and flexibility to take on tomorrow’s challenges. 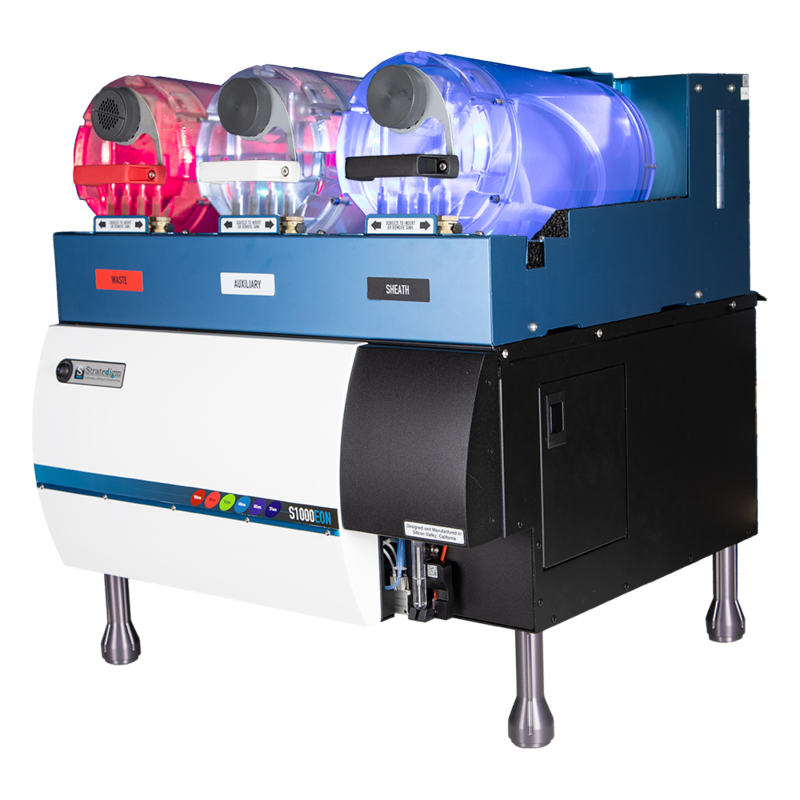 The 6-laser, 30-parameter S1000EON flow cytometer is built to provide you with the ultimate in scalability, upgradeability, and performance. 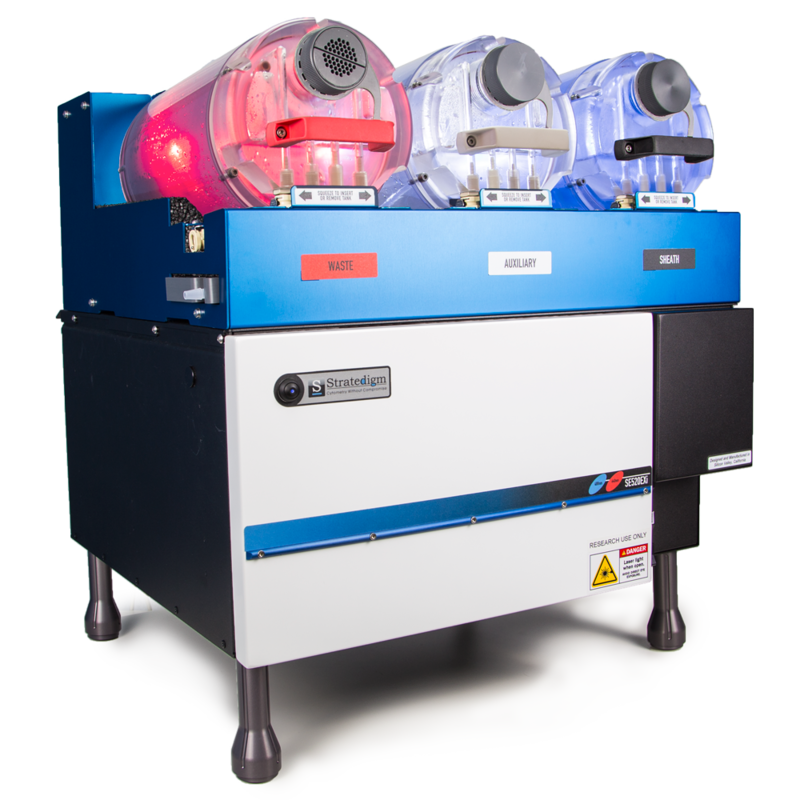 Based on the same proven technology as the S1000 series, the SE520EXi series is a 2-laser, 6-color fixed configuration system offered at a lower price point. Stratedigm flow cytometers are small but mighty. Our cytometers provide users with the best value for your budget, while taking up very little benchtop space—occupying only 21″ W x 21″ D x 24″ H. With our latest design, users will see up to 300% improvement of sensitivity, 5 decades of dynamic range, and up to 4 points of interrogation. And Stratedigm’s patented optics, fluidics, and electronics are perfect for executing challenging applications like microparticles with ease. With Stratedigm’s field-upgradeable and modular designs, users can add automation any time. Automation allows users to reduce errors, time, and human power. To learn more about our automation products click here.